7th of July 2009, can be counted as one of the important day of the year especially this year as I'm trying to realise one of my dream on this day. Ahh~ I love number 7! And as usual, the 3 of us will be heading out to make my dream come true! Of course not KLCC la, is the Concourse Area of KLCC, where Estee Lauder is helding a function for the Model Search 2009! 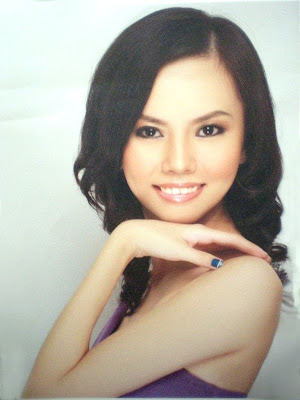 Year 2007, I told my mum that there's this model search thingy going on... And surprisingly she's supporting me to go on with it! But too bad that time I was not really free for the period when they hold the event, so I'll make up my regret today! I walk up to their registration counter and made the payment for this. RM280 for your information. But another side of my story will be, I have to leave a memorial thing i.e. potrait or something for this year! Year 2009! If I don't, for sure I will regret! When I sign up and waiting for make-up artist to do my make-up, I can feel my heart beating as fast as it can! Is this how it feels like when you're going after what you wish? If yes, I think I felt something amazing!!! I'm very curious how bloggers manage to come over the embarassing moments of being told 'No Photos Allowed'? Won't you feel embarassed of being confront like this??? I think I'm one girl that lack of bravery... I need to accumulate more and more life experiences to achieve more in my life I think. For the make-up, we're given 4 types of make-up for selection. I really don't know what kind of make-up I'm suit with, so the decision is make by Fara the make-up artist. And mine was 'Classic Beauty'. That's why you see all the 'earth tone colours' on my face. And after hairdo, we have to change to dress for the photoshoot session. I was nervous during the photo taking session... But the photographer said I'm quite good at posing and asked do I always go for photoshoots! That really add some confidence in me! Change back to my own apparels and I waited for 10 minutes till my turn to choose which photo I wanna print it out. As I mentioned earlier, all these are just trying to persuade woman to splurge more and more money in making this one time experience unforgettable. I paid RM280 for this model search thingy, and I will get RM230 worth of Estee Lauder products. So it'll be RM50 for the potrait thingy. And this time, at the very moment when you're telling your heart to settle down for ONE prettiest shot, the person will tell you: Actually we got some other options to print more shots of you... You can choose this: 1 big frame and 3 small frame of pics for RM1xx... Or you can buy a CD contains all the pictures of you for RM100! Sounds tempting, but for me who is seriously poor, I do not have extra moolah to spend on these. Say bye bye to all the pictures of mine. :( But still I gave in and paid extra RM10 on laminating a water-resistant film on top of my picture so the colours won't fade easily. One frame choosen, and now for the retoucher to put on some magic! You can see clearly the difference of before and after the photoshopping process! And all I remember is they adjust brightness and contrast, clear off the blemishes and skin imperfections, cloning, and liquify a bit! And too make the picture more pefect, they added some blur-ish feeling! All photoshop process done within minutes! PRO!!! After I get my A4 potrait, I head to another side and redeem the products. And to my surprise, there's hell lotsa of products!!! From skin care to make-up to fragrances... Honestly, I don't know which to choose! After the sales assistant explained and introduce, I made up my mind and wanna get the limited edition model search make-up kit which cost RM220. That means I still have RM10 balance... Bah~ Who cares, I just want to go home earlier, I'm tired. BUT... the sales assistant said I'm not allowed to redeem anything lower than RM230 value... That means I need to buy something, make the value above RM230 only I can redeem the products. And he gave me a face full of darkness, showing me white eyes and telling me for being such an idiot for getting conned. And kena conned so OFFICIALLY! I asked that sales person what's the cheapest item in their product range, she said either one tone eye shadow or eyeliner. So, I paid an extra RM60 for the eyeliner in order to redeem the make-up kit and at the same time, feeling pissed off. What a lousy purchasing experience! And that'll will be the end of the whole model search experience. Lousy ending. After that, me and Bun decided to go to Isetan baby's room to rest a while. Bun is taking care of Xuan Xuan for almost one and a half hour while I'm not around. And me, whom feet pain due to long hours of walking and standing with a pair of heels, seriously need some rest too! And by here I end this post!!!!!!!! Haha~ What you mean by: WAIT! WHERE'S YOUR POTRAIT!!!??????? Wow, you are a one brave blogger Reiko! You dare to snap pics! xD Waaaa you look so different!!!!! But then okay lor, I means is once in awhile. hey!! You look so pretty, I think the potrait is perfectly done!